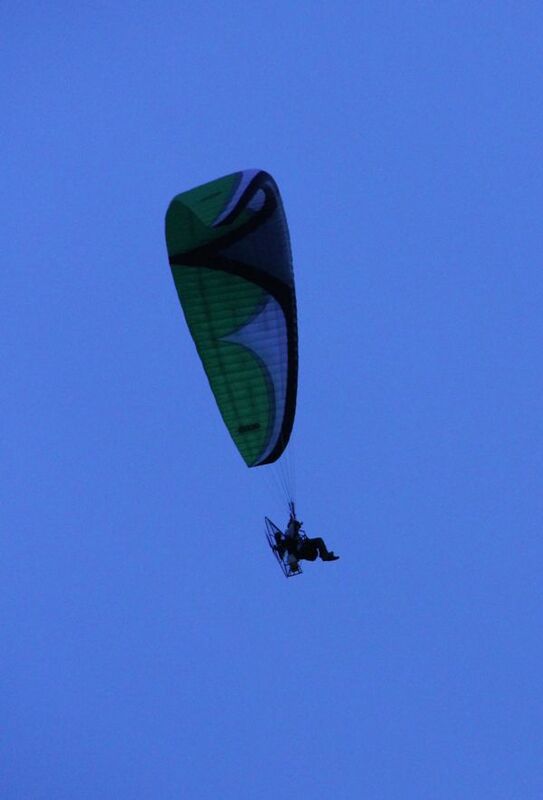 [Updated] A somewhat unusual sight was spotted in the skies this morning [May 7] as a paramotor took flight, with the motorized steerable parachute making its way over Bermuda. 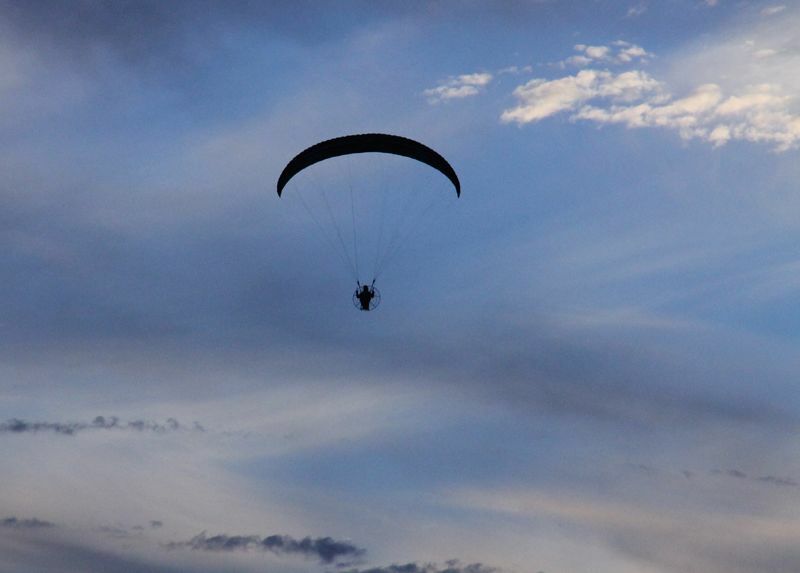 According to the British Hang Gliding & Paragliding Association’s website, “Paramotors [also known as a Powered Paragliders] combine the easy flying characteristics of a paraglider with the autonomy and range of powered flight. “This simplest of all powered aircraft consists of a small motor driving a propeller, worn like a backpack under a paraglider wing and providing thrust to take off, climb and maintain level flight. “Once airborne, the paramotor can be used to motor along and watch the world go by beneath you or, if conditions permit, soared in thermal lift to make long cross-country flights. 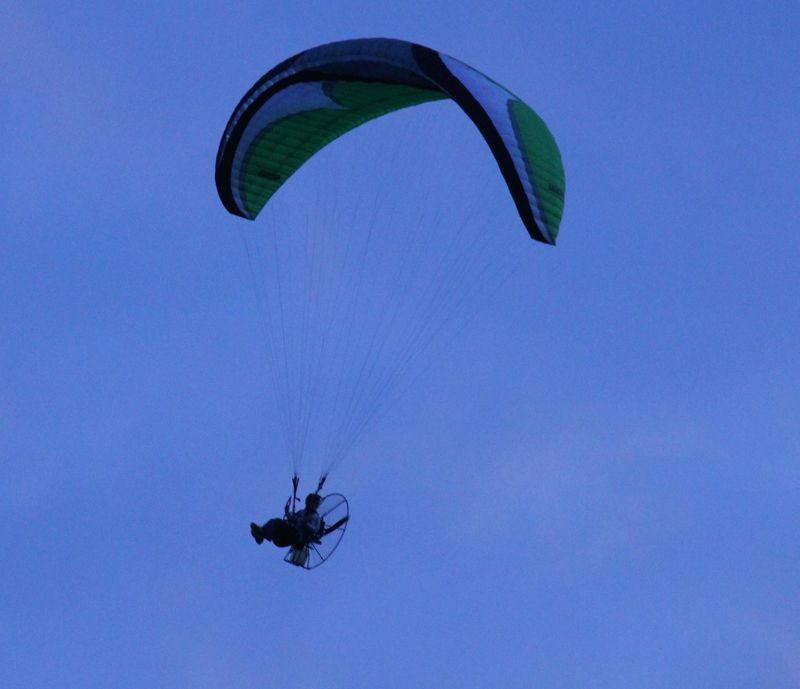 The Department of Civil Aviation said they are actively looking for the individual operating the paramotor, so if you know anything please contact Mr. Tariq Lynch-Wade at 299-8625 or email talynchwade@gov.bm. Where did he get trained?? I want one!! It would’ve been very fitting for him to land on Government House. It sure is a good thing Government Depeartments don’t have phones that work between them or people who can figure out that maybe, just maybe, make a call to customs can track down who brought it in. Other than noise these things are hardly a threat to anything but the birds. Don’t think anyone would attempt flying it close to any runway approach path. Wait for it. Something else for the powers that be to say “NO” to. Not at all. There is some law that allows these things. I’m sure they just need to verify that this person has all his “screws”. Great way to commute to work! This is Bermuda; there’s probably a law against that. If not, there soon will be. hah There is only one person I know on Island that would pull this off. It was only a matter of time. Can we make this legal so I can join? Why is everything fun illegal in Bermuda? Where is the skydive drop zone (prob the most picturesque jump zone in the world), where are the LONG ziplines down south shore (build out of telephone poles so it blends in and can be removed without damage to land), where is the bungee jumping (use a crane, again so it is temporary) Where is the flight school to learn how to fly airplanes?….Why does Bermuda Have to be sooo lame when it comes to this stuff? Maybe if there were some more adrenaline pumping activities out there, kids would be less inclined to do drugs when looking for a high. Anyways, back to work…yawn. Have you seen the restrictions and regulations for the use of the newfangled drones ? They’re barely the size of the propeller on this thing . Why ? Because of the concerns to commercial aviation . We’re a tiny speck with one airport so these things are never going to be far from flight paths no matter which way you look at it . Anywhere else in the world they can be freely used in the country side and be 100 miles away from the nearest airport . Do you remember when there was a guy who did helicopter charters about 23 years ago ? As soon as he started there was an uproar about the constant noise and threats to people’s privacy as they lounged in their back yards or around the pool. A couple of these things are going to quickly raise the same ire. And all of those wonderful things that you suggested ought to be done require people with money willing to take a chance , where are they ? Or are you suggesting that government does it ? If we can parasail and fly kites then it should work fine…It just needs to be regulated with altitude restrictions, no fly zones near airport (radius TBD), certain fly times (no night flights), must stay above xxxft while over land etc… Bermudas airport is really not that busy compared to most. This guy above did it with no communication with ATC and i’m sure did not encounter any close calls. Imagine if regulations were in place, it will be fine. Like all those ‘regulations’ we have on the road . They work out really well too , don’t they ? for the ones that abide by them, Yes. Typically someone who is operating something that flies has a bit more common sense. There was a recent Germanair crash that unfortunately lays that theory to rest . Not to mention about 6 others that come to mind . Bernews: can you follow up with civil aviation as to what exactly the rules are on this? I want to buy one. How do you go about doing this? You have to dig a bit further back than 2014 . This is in fact something I would like to do. I’m not a hater. You sound like all those people who believe that anyone who says anything negative about Bermuda , no matter how factual , is a non Bermudian . Guess what? We do have a flight school here – Ground Aviation run by Pete Wilson!!! So that’s one down!! You are correct… “Ground” aviation. Don’t try to land on the Cabinet grounds. You may get shot down! I saw one of these for the first time last year while vacationing in the Azores. I think they’re pretty cool, but if your going to do it do it right, get permission don’t ruin it for others. He was a passenger off one of the visiting yachts. A visitor by boat. Probably missing a few screws and didn’t know that it was illegal. Which just goes to show you that because you can operate one doesn’t mean you have a lot of common sense. I bet that a lot of commercial pilots regard them as the cockroaches of the sky when in the wrong hands. Just like knowledgeable boaters regard jet skis . 2 different wind parameters required . 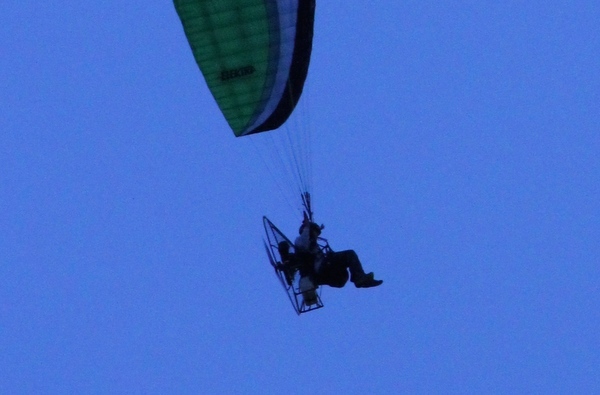 The one to comfortably and safely operate a paramotor means that the AC boats will be doing about 10 knots . Paramotors takeoff wind speed limit is 25KPH…AC45′s are capable of traveling approx twice the wind speed which would let them travel 50KPH at safe operating speeds for Paramotors…GO HOME Toodle-oo, you’re a hater. In relation to airspace regulation and management, were one of these to breach the safe operating radius around the airport, how exactly do you suggest the aviation authority gets the ‘pilot’ clear of the vicinity quickly and safely? 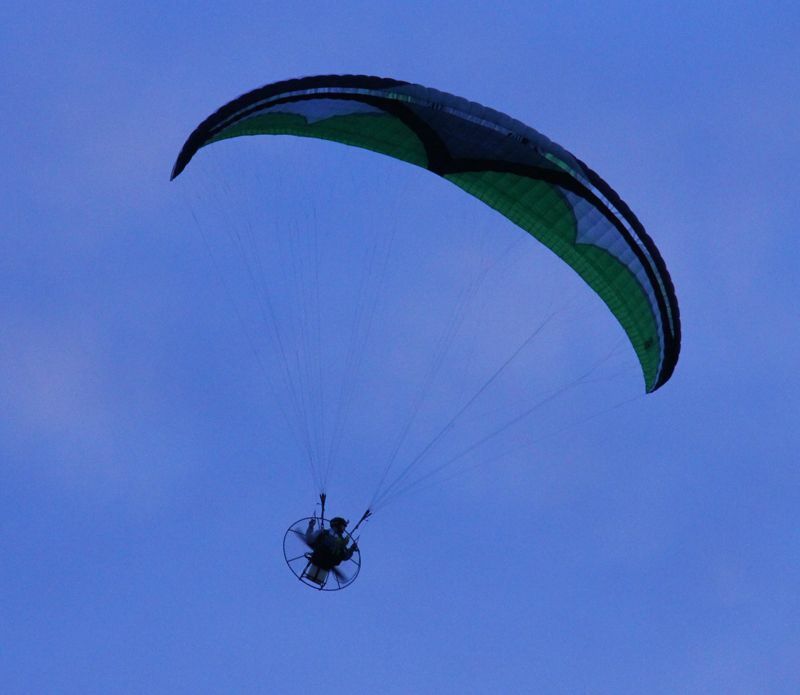 Operators of these Paramotors don’t generally carry any form of civil aviation comms or nav equipment (radios or transponders). How would you suggest communicating with them when they’re in breach of controlled airspace? Flags? Semaphores? Flight is a serious matter. These are not toys. There are a host of safety considerations that need to be taken into account before making a decision on legalisation of this ‘activity’. Have a bit of cop-on here. Just because you have the means to indulge doesn’t automatically give you the right to. Be careful there … you’ll be branded as a stodgy old kill joy by everyone who wants everything they see without thinking of the existing and potential ramifications. Not bothered. Been called worse by worse. Way too much fun for stodgy old Bermuda. It will be made illegal very just like most things that could be regarded as e citing. Bermuda as usual will legislate itself back to Victorian times. Good idea in america where there are huge tracts of land to glide over, but in bermuda which is tiny and almost entirely private housing it is a stupid idea and invasion of privacy. people flying around with gliders, copter cameras etc are a violation of our rights to privacy, but the people using them get away with it because our lawmakers have no gonads or brains to pair with them. some people who use all these flying apparatus snicker to themselves how they get to peep at everyone and girls and women. and i have seen a documentary on how lethal and dangerous such flying manned devices are, and watched one with a family crash into the ocean and almost drown on it while strapped in.